South Whitehall Township. Hill is near the soccer fields south of Broadway at Parkway Road. Allentown. Steep hill between Cedar Crest College and the park. At end of Honochick Drive (near picnic pavilions), behind Moore Hall. Allentown. East side of Oxford Drive at Devonshire Road. Wide, short hill is a family favorite. Stay away from the baseball field fence. Allentown. Big hills between Park Drive at top of park's west side and Little Lehigh Creek. Allentown. East of YMCA/YWCA at 15th Street and Martin Luther King Jr. Drive. Watch out for dips and drop-offs; not recommended for those unfamiliar with the terrain. At Jordan Creek Parkway, Whitehall. Wide, long hill on south side of Lehnert Road between Mickley and Mauch Chunk roads. Allentown. Hills in park at S. Halstead and E. Union streets. Bethlehem. Hills near school at 1621 Catasauqua Road. 1200 Springhouse Road. Hill at the school between Crackersport Road and Amherst Road straddling Allentown and South Whitehall Township. 501 American St., Catasauqua. The park is known for its "three dips" section, where sledders can zip over three hills for a roller-coaster effect. 1625 N. Route 100, Fogelsville. Hill is off of Hilltop Road, which curves around the north end of the park. 345 Illick's Mill Road, Bethlehem. The hill behind the ice rink and the city's Memorial Pool is a popular spot for sledding. Bethlehem. Hill is between Walters and Rockland streets on the west side of Stefko Boulevard. At Roth Street and Black Rock Road. There is a long, grass-covered hill next to the dog park. Hackett Avenue, Easton. Hills are in the park between Wood and Gruver avenues. 2601 William Penn Highway, Palmer Township. Hill is on the side of the school facing the supermarket. Center Valley. Hill is in the northern section of the campus off Landis Mill Road above DeSales Drive. Off Route 563, Bucks County. Sledding is best at the hill above the marina. Park in lot No. 13. Schuylkill County. Sledding is available in the park, which is 8 miles west of Tamaqua. •Dress children properly for outdoor activities. Several thin layers keep children dry and warm. Don't forget warm boots, gloves or mittens, and a hat. •Keep young children separated from older children. 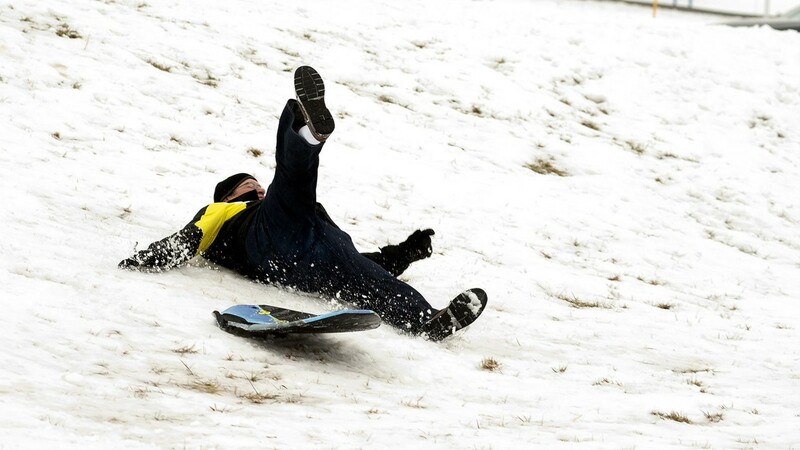 •Sledding feet first or sitting up, instead of lying down head-first, may prevent head injuries. •Consider having your child wear a helmet while sledding. •Sleds should be structurally sound and free of sharp edges. •Sled slopes should be free of obstructions such as trees or fences; be covered in snow, not ice; not too steep (slope of less than 30 degrees), and end with a flat runoff. •Avoid sledding in crowded areas.